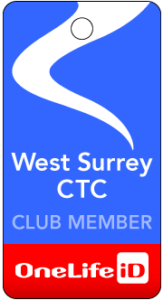 Kindly note change of café destination on Sunday morning for the Guildford & Godalming Wayfarers, as previously notified by email. This advice is for those not on the GGW email distribution list, and who planned to go directly to Haslemere for coffee on Sunday (as advertised in The West Surrey Cyclist). The ride on Sunday starts at Godalming at 09h30, and will now go to the Orchard Barn Café, Hale House Lane, GU10 2LU (near Churt) for coffee.